Bommadevara Sai Chandravadhan aka Vadhan always loved writing. He started writing his first novel when he was 12! Incidentally it was fantasy fiction. Interestingly, he just finished the book a few months ago. Vadhan loves cricket, tennis, shuttle badminton, table tennis…and golf. He seems to be good at time management as he looks after his business (he is a lawyer by profession), sports and writing. You can look after multiple tasks and responsibilities only if you enjoy doing them all by heart. 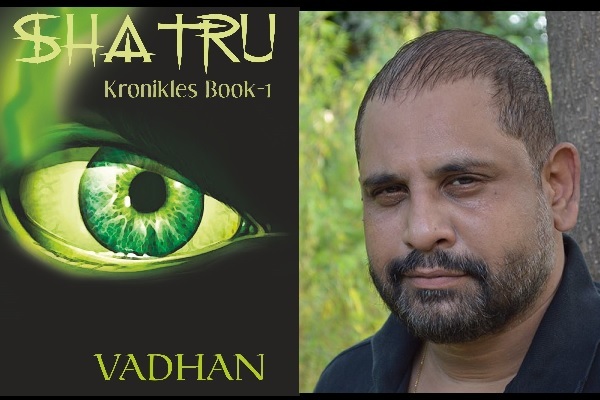 Recently we got a chance to read his book Shatru – Kronikles – Book 1. It was a delightful experience. We know that it is easy to judge the work rather than doing. But at the same time, the genuine reviews and views about any media will help other people having the same interest to decide whether to go for it or not. First of all thank you Mr. Vadhan for finding time to talk to us. Hope you are enjoying the moments as your book is available for Indian as well as International readers. Can you share your feelings please? Well, I am extremely humbled and grateful for the response my book has received. It is a vindication of my belief that I have a great story to tell. “Top of the world” would best describe my condition right now. The story seems to be in your mind since years, and you must have clear vision of how it will progress (that’s why you can plan 4 books in the series), can you tell us something about it please? Well, it started off as one big book. It got tossed out of many a publishing house, some with kind remarks and others with no remarks at all. Someone told me publishers don’t appreciate first time authors chucking thousand page manuscripts at them. I got the hint. But in the long run, I think it worked out well. I am able to explore so much more now at the granular level. Kronikles as a series has one main plot. Each book has its own sub-plot and stories that tie in with the main plot and push it forward. The main characters keep coming into the book gradually. I have a lot more to play around with and improve while building characters, personalities, situations and even whole worlds. I believe it’s going to be four times the fun! Actually, it seems that the book manuscript is re-freshed over re-reading (to make it better of course) right? As we see the reference of Twenty20 games and other recent events. There were 20/20s when I started the book. So, I didn’t really have to redo much except to dig in deeper to bring out the best in the story. My other book (which will come out sometime in 2016/17) which is not part of the Kronikles, was the one I started when I was 12. There was a lot more redo there. The concept of putting Devas, Asuras, Gandharvas and other in a mythology tale, which progress in the modern world be quite challenging right? What made you think they can be business allies running a corporate, its quite an innovative idea. Well, Look at it this way, they were written about at a time when there were kings and queens, kingdoms and wars, etc. They were therefore fashioned to fit into that world. We do have kings and queens, kingdoms and wars even now, but they are called different things. So, if we as a species evolved to something else, the “Primordial Tribes” or “Demi-Gods” as I call them, would have to fit in with our existing cultural backdrop just so they don’t stand out like sore thumbs. I presume that they are far more intelligent and resourceful than we give them credit for. How difficult would it be for them to manipulate our systems to control them? It’s a “what-if” scenario I liked to work on. Which other authors you really love to read (of course we can add C. S. Lewis to the list for sure as you have mentioned him in the book right 🙂 )? Stephen King, Lee Child, Robert Ludlum, Tolkien, R.R.Martin, Agatha Christie, Arthur Conan Doyle, P.G. Wodehouse (all time favorite for any time of the year), Rowling (to a limited extent), Dean Koontz, Grisham, Subroto Bagchi, Peter Drucker and tens of hundreds of others. My house is filled with books. Lord of the Rings, Hobbit, Game of Thrones, The Dark Tower series, Mostly all of Lee Child‘s books, mostly all of Robert Ludlum‘s books, The Elephant Catchers (my corporate Gita), The Practice of Management (my corporate Vedas), mostly all of P.G.Wodehouse, Arthur Conan Doyle and Hercule Poirot series by Agatha Christie. The list is endless. My house is full of books. Make Me by Lee Child, re-reading Wodehouse and Christie. Seems you are a nature lover. (We have enjoyed the conversation between Shatru and the Tree.) Anything you think we should do as the priority thing to save nature? Don’t cut any more trees. If the human race is extinct, the world will thrive. It will die without trees. We need to think beyond ourselves here. When you cut them, trees hurt. Just because they can’t kick you in the shin and run for it doesn’t mean they don’t hurt. As a rule, I am not gung-ho about retelling stories, either from different perspectives or from different time frames. I like pure fantasy fiction. Sure, take the mythological backdrop, even adapt a few characters but tell a story, don’t take someone else’s story and twist it around. It’s not fair. India is a land of fantasy stories from the beginning. We love our myth and we love telling the world stories of our myth. Surprisingly, some of our stories have started gaining foundation through quantum physics, for instance our concept of Maya is what scientists call reality at a sub-atomic level where nothing except the atoms exist. India has a lot to offer the world in terms of stories, truths and takeaways. What we have is a new breed of authors who are doing just that. What we need is a lot more volume in vocabulary, presentation skills in written English and good editors who know their jobs. That’s my two-bit. I said this in another interview and also on my website, I think. I am like a little kid with a machine gun. I shoot. The bullets spray all over the place. The target is leaning against the pole, whistling a happy tune and making faces at me. That’s me writing. I have no issue with flow. In fact there’s an overflow. When I complete the first draft and sit back with a smile, the editor in me whacks the back of my head with a large blunt instrument. This goes on until I finally am able to set things right. Having said all that, what it really boils down to is, I can write anytime, anywhere and I can switch on the creative monster lurking inside any old time I want to. I find myself scheming during meetings, during phone calls, etc. I can write on a plane, train, their respective docking areas, under the tree, in my office and in the middle of the chakravyuh! Every word in the book is precious to me. However, I will say that the introduction of Shatru is one chapter I loved writing. The Dock area chapter is another great favourite, especially the conversation between Shatru, Kris and the goons after the fight. The Underfabric had a lot of visuals in it. I had to do a lot of work for that but I think in the end it was worth it. The chapter when Shatru and Kris meet Kausalya’s slightly off-balance father was something I worked hard for and enjoyed writing. Of course, you cannot spill the beans about the content, but can you give us some hints about what to expect in the next set of books of this series? Based on your imaginative writing, definitely you have a long career as a writer ahead. Do you imagine yourself writing anything else than the fictions? Not really, at the moment. But then, I am not too sure. Let me be precise, you are a lawyer by profession and by having so much experience in the Legal world; are you seeing yourself writing a legal thriller (like John Grisham does)? The book I am currently working on is based on trademark issues in prescription drugs. It is not strictly a legal thriller but it has a substantial amount of courtroom drama. I wrote this book just so I can take a break from Fantasy but the funny thing was I enjoyed writing it. The flow was absolutely remarkable. I am doing the finishing touches right now. 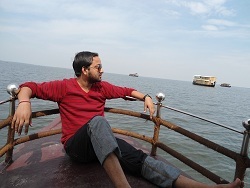 There are many writers who love to explore the world of their job / business / expertise; for example Ravi Subramanian wrote many Banking Thrillers, (John Grisham goes for Legal thrillers of course), Maya Kavita’s book are canvased on IT field and so on; what specifically insisted you from within to write a Fiction which revolves around Indian mythology? I spent a childhood steeped in mythology with grandparents who were such good storytellers. I lived those stories and created new ones as I grew up. I was good at telling the stories that I created to my daughter and son. When they grew out of it, there I was left with all the stories with nowhere to go. That’s how Kronikles began. In English? Well, Hugh Jackman is ideal for Shatru. As for the other characters in the series, I don’t want to spoil the fun right now. Let the readers first enjoy them before I can hazard a guess on who should play them. Do you have estimated schedule of the release of next book(s) in the series? Yes, in fact I do. The second part is sure to hit the stands by end of ’16 or beginning of ’17. Thereafter I am looking at a book every year for the remaining two. I enjoyed writing the Kronikles. I am overwhelmed by the response. Keep reading. There’s nothing like a good book. We have enjoyed the conversation and hope you feel the same. Do you have other questions you want to ask the author? Let us know in that case.